The cute and almost dreamy face of a Canadian Eskimo Dog puppy with its perky ears and unique markings. This cute breed is most in it's element during winter and when it's hard at work. A breed of dog that was on the verge of extinction, the Canadian Eskimo Dog has made a come back in recent years through the efforts of clubs and breeders. This puppy with its cute face, who was a little sleepy at first, could be trained as someone's companion or as a sled dog. Canadian Eskimo dogs are a working breed of dog and generally are happiest when they are keep busy and active. Canadian Eskimo Dog puppy, Canis familiaris, in the town of Churchill, Manitoba, Canada. 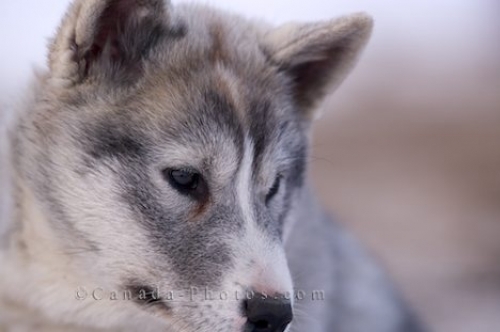 Picture of the cute face of a Canadian Eskimo Dog puppy in Churchill, Manitoba.